Leaks should be easy to find and deal with; this one hid from us-in plain sight! Like all quality plumbing companies, we know how to use pressure tests to both identify leaks and prove to ourselves we don't have any. We did this as part of our standard procedure on this job. Early on we had a leak on the household pressure side of our normally-closed, system-refill ball valve. As the system was functional, and the repair visible (so we could see any leaks) we did not repeat the pressure test. This project started to rust up! Now the fine folks at Bock water heaters were glad to sell us an electric water heater with 2 heat exchangers. They didn't think it worth mentioning that their heat exchangers are raw steel on the inside. 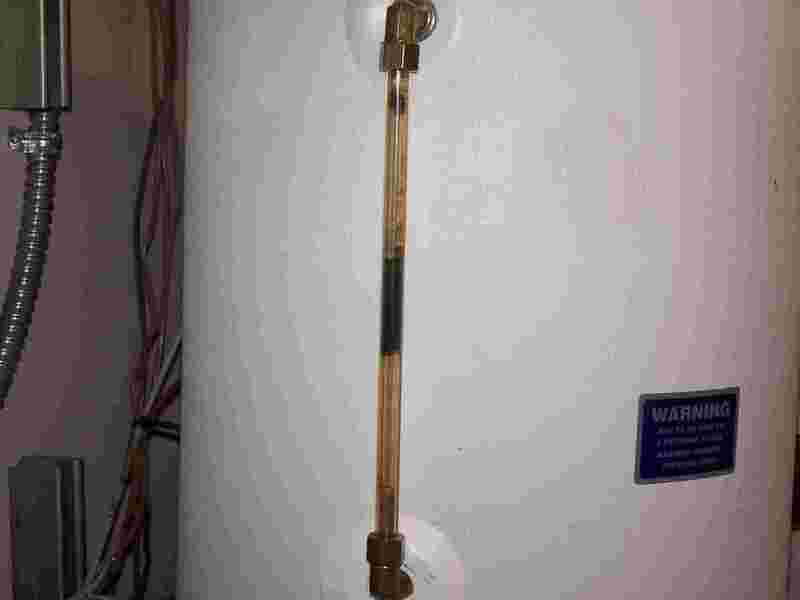 (We later learned that this is standard practice among some water heater manufacturers - the assumption is that you will have closed, oxygen barrier systems - a BIG assumption with modern hydronics!) So when rust appeared in our site glass and flow meters - we suspected that raw steel was not liking the free oxygen in the water, and perhaps some flux from system construction was encouraging the reaction. We even created a theory that this customer had REALLY bad water that ate raw steel for breakfast! Many, many TSP and vinegar rinses later, in desperation, we rechecked that the system held pressure. It failed - the happiest we have ever been to see a gauge drop! The problem fitting was on our refill system with the valve normally closed - this fitting never showed any signs of leaking, but as the drain back tank warmed and expanded every day, air was forced out of the tank at the bad soldier joint of the ball valve. Then, every night, when it cooled down and shrank, it sucked in new, oxygenated air and kept the rust well supplied with oxygen! Pay for solar once - use it forever: I kind of like that!